Polydora cornuta, copyright Erica Keppel. 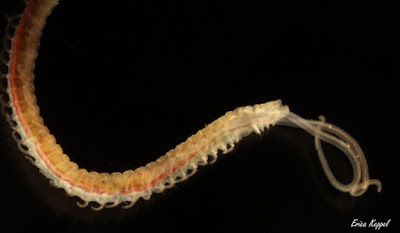 Polydora is a genus of polychaete worms that often burrow into calcareous substrata such as coral reefs or mollusk shells. Characters (from Williams 2001): Prostomium with anterior incision or rounded; caruncle extending posteriorly, surrouded by cilia of nuchal organ. Segment 1 without notosetae. Segment 5 modified with one type of major spine in single curved row, with or without companion setae; juveniles may possess large, falcate major spines that are replaced by subsequent spines. Posterior notopodial spines present or absent. Bidentate hooded hooks beginning on segments 7–14, main fang at approximately right angle to shaft, wide angle between main fang and apical tooth, with constriction on shaft. Branchiae beginning posterior to segment 5. Pygidium variable: cuff-shaped, cup-shaped with dorsal gap, lobed, scoop-shaped, or with digitiform cirri. Anterior portion of digestive tract lacking gizzardlike structure. [RP07] Rousset, V., F. Pleijel, G. W. Rouse, C. Erséus & M. E. Siddall. 2007. A molecular phylogeny of annelids. Cladistics 23: 41–63.